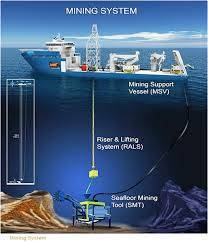 In order for deep sea mining to be safely implemented, it is necessary to ensure the protection of sensitive ecosystems and minimize the potential environmental impact of the mining operations. Hydrothermal vents are the primary source for deep sea minerals. The magma below these vents heats the surrounding seawater, which causes metals within the sediment to leach into the water. The subsequent shock of the cold water causes the metals to precipitate and form as solids in the sediment surrounding the vents. Because of these high concentrations, most deep sea mining would occur in the chimneys above the vents. The vents themselves would be preserved undamaged, but the chimneys would be destroyed in order to mine the metals encrusted on them. ROVs are able to obtain samples using drills and other cutting tools in order to analyze them for rare earth minerals. 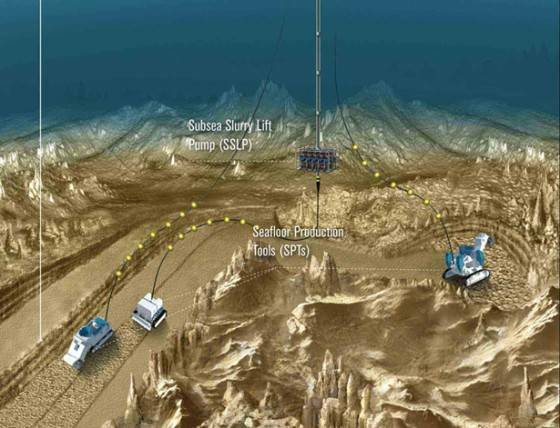 With the location of a suitable mining site, the ocean floor is ready to be harvested. 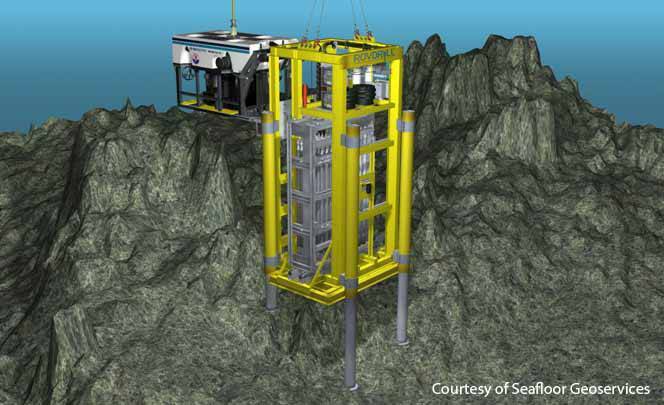 Two technologies being considered for commercial mining of the ocean floor are continuous line bucket system (CLB) and hydraulic suction systems (HSC). CLB is the preferred method and transfers the mud up to the ship in a conveyor belt type system. HSC has a pipe running the mud up from the ocean floor and another pipe that transfers the tailings back to the ocean floor. 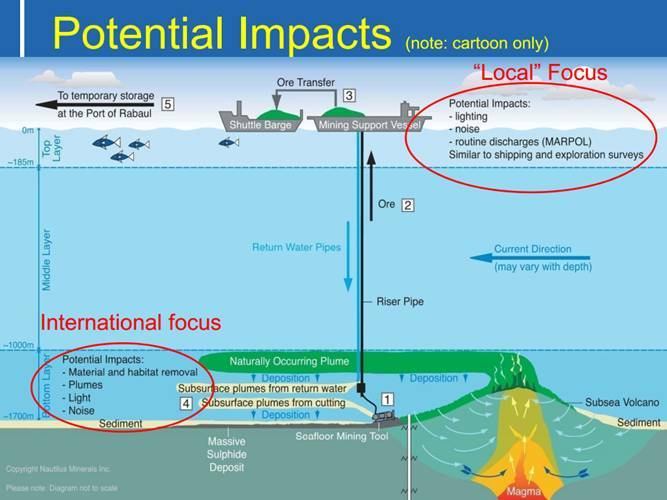 Environmental cost is currently the biggest issue with deep sea mining. 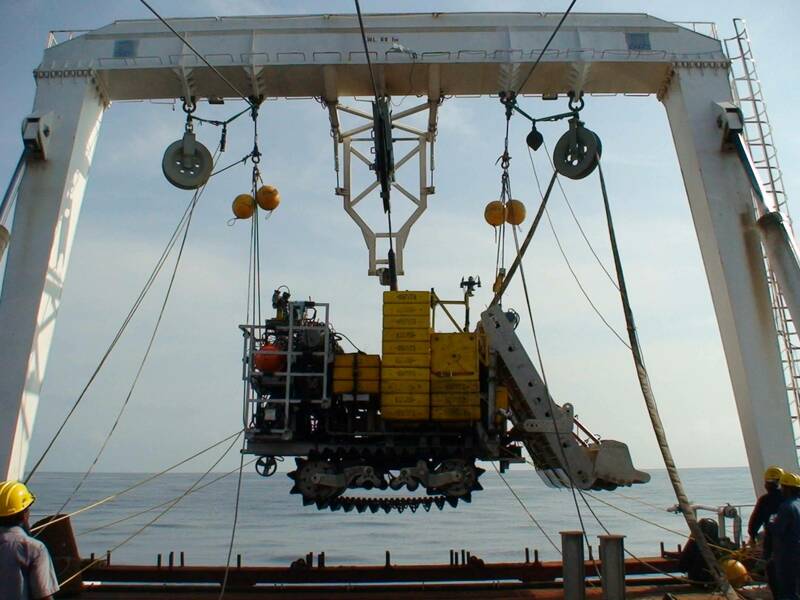 There are numerous controversies about whether or not testing deep sea mining is worth the damage it could cause to biodiversity in the ocean. These environmental costs come primarily from the intrusive nature of mining. 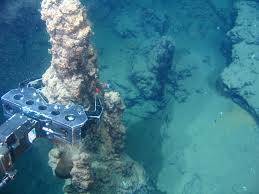 Deposits are located near deep sea thermal vents, which sustain very unique ecosystems. There are thousands of previously undiscovered species first seen around these vents and many more are waiting to be discovered. Many of these species are filter feeders, and many environmentalists fear that the sediment stirred up by mining activities may not allow them to obtain enough nutrients. However, this problem may not be as troublesome as it looks. Sea floor deposits are much more concentrated than those on land, meaning a significantly smaller volume of earth must be moved to extract the same amount of usable minerals. Less materials, consequently have to be processed, and this processing is what causes most of the environmental problems. Also, current technologies are able to minimize the actual sediment being thrown about, mitigating enough of the initial concern to justify further usage of these techniques. The extremely rich deposits near these vents mean that mining in these areas is very economically viable, and some believe that the environmental costs are minimal enough to warrant a further application of deep sea mining. 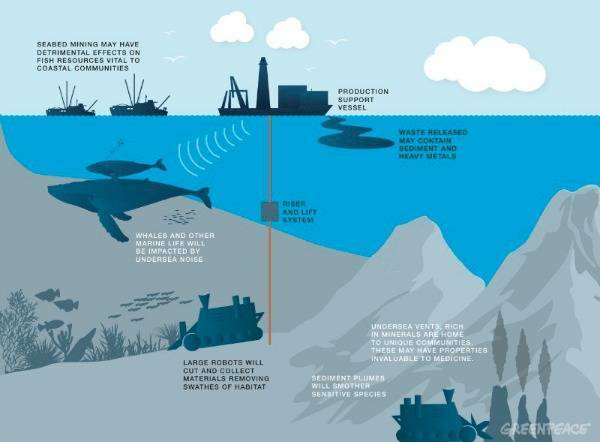 However, there is still major concern from environmentalists that deep sea mining must be considered highly damaging to the oceans, until proved otherwise.